Through an analysis of several financial indicators, McKinsey concluded that organizations stand to benefit by implementing a greater number of IoT use cases. The effect levels off at around 30 applications. While McKinsey’s advice is tactically safe, there are prudent reasons for IoT adopters to take a wider and strategic approach. That involves looking beyond the core of what a business already does. It will involve multiple learning curves and a pro-active discipline for cultivating new business opportunities. The need for a strategic perspective is a consequence of the IoT's extensive reach across broad swathes of the economy. In many respects, it’s no different to the internet phenomenon. We can safely predict that all businesses will be affected, either from direct competition or indirect business-model innovation. The issue of balancing tactical and long-term imperatives is not new news . The situation is not dissimilar from the industry dynamics that saw Blockbuster, Kodak and Nokia lose their industry-leading positions. In the case of Blockbuster and Kodak, managers in both organizations had a decade of notice regarding the industry changes bearing down upon them. A simple way for organizations to test the scope and robustness of their IoT strategies uses the following matrix. 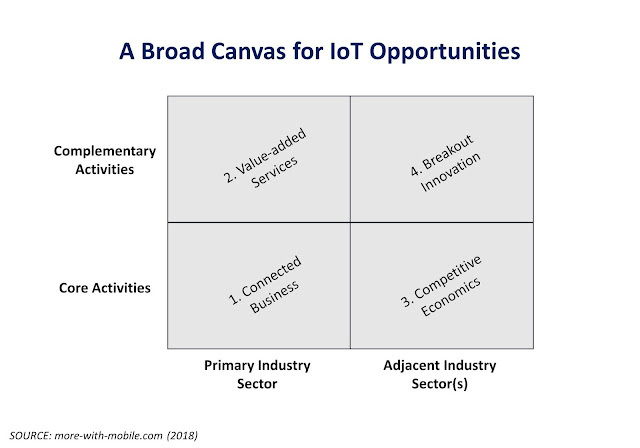 Beginning with McKinsey’s first IoT habit, organizations start in their primary industry sector doing what they do well in their core business activities. Asset owners typically begin with a ‘connected business’ strategy. This involves the application of remote management technologies, such as upgradeable software and wireless connectivity, to turn standalone devices into a ‘smart’, connected devices. The second strategy extends to complementary services, in the form of value-added services on top of ‘smart devices. A typical example is to use data from one or more connected devices to improve asset efficiency, as in the case of route planning for a fleet of vehicles or inventory management in vending machines. A third strategy comes about when a firm faces competitive economics from businesses in an adjacent industry. This may involve a firm extending its reach into an adjacent industry sector. Or, it may involve a competitive threat as outside business encroach on a given firm’s primary market. There are numerous examples of internet businesses encroaching into the telecommunications sector with universal communications application alternatives. The fourth strategy takes the form of breakout innovation when ideas from an adjacent industry sector build on capabilities from a primary industry sector to spawn completely new products and services. An example of this is the application of e-commerce marketplace ideas that are being used to match low price-point buyers and sellers for accommodation (Airbnb) and transportation (Lyft, Uber). What’s to stop these ideas from being applied to use spare capacity on large scale machinery or industrial production facilities? Firms seeking an edge from the IoT will have to assess potential opportunities and threats in each of the four strategy categories of the matrix above. There follows a set of investment and management actions. Budgeting, for example, should focus on core activities with a modest amount staked on new application areas and relationship building with potential partners. The same is true for IoT expertise. It won’t be enough to grow expertise from an internal base because organizations will need to bring in new types of knowledge (technical, product/service management and go-to-market) in addition to making a few partnering types of commitment . The idea of embracing opportunities as they arise won’t be enough. Such an approach leaves too many new and transformative prospects unaddressed. Businesses must tackle the IoT market pro-actively.